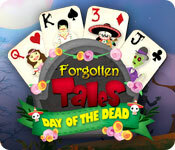 Forgotten Tales: Day of the Dead is rated 4.3 out of 5 by 24. Rated 5 out of 5 by graceland9 from Really Fun Solitaire Game I enjoyed Fairway solitaire, so when I sampled this card game and found it was the same type with some cute changes, I was a buyer. Entertaining games that keep me playing for longer than a few days are rare, so this one's really a keeper. The hero is Manuel who's trying to win back Maria from the Dead. In order to find his love, he has to collect ingredients for an extremely complicated magic potion. Along the way he fulfills quests, all by playing solitaire - as you do. 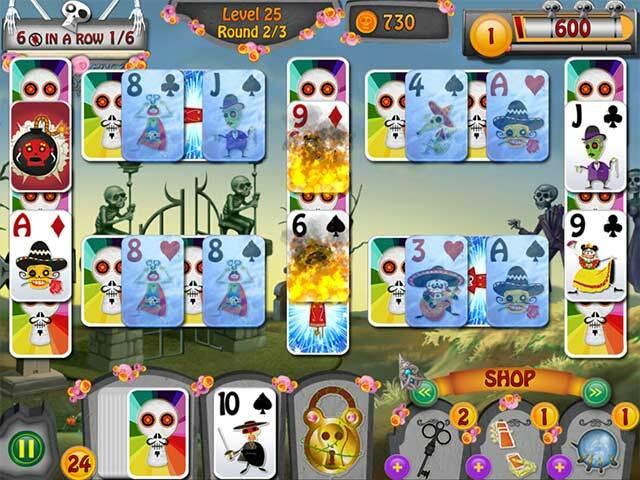 The solitaire games are made challenging by different rules each time: Get 8 in a row with no diamonds, No mistakes, etc. There are magic cards like Shuffle the Deck and Wild Joker, which you can buy from money earned through straights and leftover cards. The graphics are bright and bold. I really liked them, but that's a matter of taste. In any case, it's the cards that are important! Did I mention long??? I'm on the 52nd chapter, and I haven't finished the potion yet! If you want a card game that gives you your money's worth, this is it. Rated 5 out of 5 by nilmdts from Best Ever ! Best game ever ... 10 stars...save your money for the last games 91 - 100. Soooooooooooooo Much Fun !!! Rated 5 out of 5 by Tanith_L from Unique and stand-out game, regardless of genre I've written maybe 3 reviews since becoming a BF member (and it has been too long ago for me to even remember the year), but I had to write a review for this game to encourage BF to support more games like this (and the developer to make a second one!). This game has it all: great music (yes, it's a bit repetitive, but I didn't find myself tiring of it because it's well-done); a unique storyline that is well-told; great graphics; and fun, clever game play. The story is told in chapters, and you meet a new quest-giving character in each chapter. The powers that you get with each chapter are mostly the old stand-bys (remove a specific card, shuffle the cards showing, a Joker that allows you play any card on the board onto it, etc. ), but there are some fresh ones as well. This is one of those games that I don't want to finish, which I'm sure all you other BF gamers know is high praise. I wish there'd been a CE with additional game play at the end, but maybe they'll offer that in their next game! Rated 5 out of 5 by ethan1404 from Actually, a great game! I rarely buy games such as this, given I am a puzzle/HO CE addict but had nothing to play, lots and lots of coupons ... looked interesting so went for it! Well, I am still enjoying this game, not mind-blowing but fun, enjoyable and even tasks set are more than achievable. Haven't got quite to end to see if he finds his "true love" but am up to chapter 90 so a good, long game, value for money! Why I like this particular card game as against others I have bought, is that it is never unachievable! You won't have to play the game over 100 times to achieve your goals! Love that as nothing frustrates me more! This game is fun if you like card/solitaire, occasionally challenging but never unachievable, just relaxing, enjoyable and a few laughs at the items you have to find! If you have a spare coupon or two, enjoy a bit of relaxation playing solitaire but do not want it to be taxing, then definitely go for this fun game! As I said, not normally my genre but am surprised at how much fun I have had playing it! Rated 5 out of 5 by Karavan from The best solitaire game yet I am very impressed! This was just really fun. Such a cute engaging story, good graphics, good sound (I usually turn off the sound but I kept this on, it added to the pleasure). Challenging with different goals to get combinations, boosters.bombs and rockets to clear the board. I have been bored with other solitaire games in the past but not this one. Congrats on a winner. 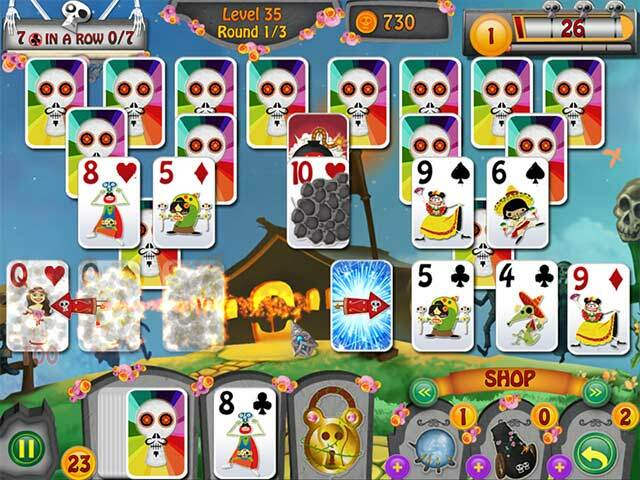 Rated 5 out of 5 by laurathunder from awesome solitaire game ! This is the best solitaire game I have ever played! It's seriously not boring because every level has a different goal. I had to go back to earlier levels to get money until I learned a good strategy. I so very very recommend this game! Rated 5 out of 5 by shepherdmoon from Unique solitaire game! LOOOVE it! This game is unique among its kind. I haven't been this excited about a solitaire game since Fairway Solitaire. Not your same-old-same-old solitaire game at all. This one is innovative--each deck you are given is for *3* games, not one. This makes it more important to make sure you don't waste your moves and save some cards for later. It adds strategy to a game that is typically rather brainless (not that that's bad--it can be soothing to just click high/low/high/low... but it can get old). Also, there are power-ups and special cards that require strategy to determine when to use them. For instance, there is a bomb card that will appear on the board that you can set off to destroy all surrounding cards. Should you do it?? Depends... do you need those cards? Might be bad to destroy them... you have to think about it. Clever developers. There is a story too, and the graphics are pleasing. I recommend the game. Rated 5 out of 5 by sashasabre from A Clever Take on Solitaire I love the little adventure that is included with this game, it makes solitaire more interesting and fun. The graphics are brightly colored yet not childish, just whimsical. A good game for all ages, including adults like me! Rated 5 out of 5 by moonlit_rose from Darling Card Game -- So glad I gave it a whirl EVERY thing you want in a solitaire game! *One-use Power ups that you buy as needed with coins you earn playing. This way you aren't using several 'cheats' every round as you level up. (Example, going back one turn) *Cute graphics and unique artistry that isn't the usual (read: over done) 'modest' female heroine in every chat scene *Music and Storyline that are simple and enjoyable, so that you're not mashing the mute or skip button after a couple hours. *A large catalog of items you will need to collect throughout the levels. Not only do you watch your character move along the track but its also satisfying to peek at your collection progress, knowing there is much more to come. *The bonus cards (such as bombs) and card blockers have fun release animations that keep you perked up. 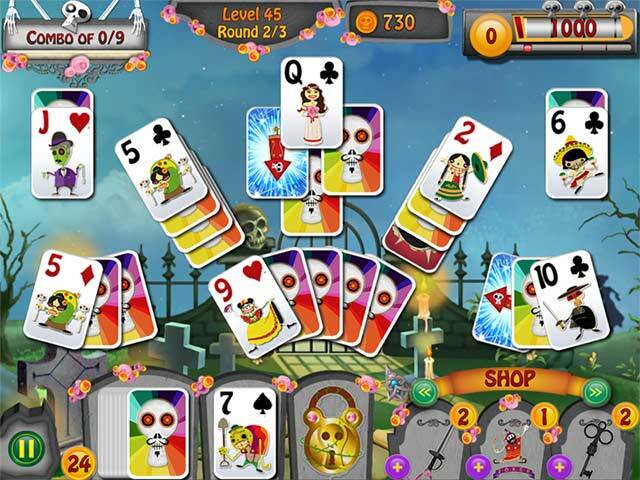 It's a very fun and laid back game, but with more bells, whistles and flash animation than other card games I've purchased on Big Fish. This one holds my interest better when I'm looking to kick back and zone out, but not in the mood to focus on a puzzle/HO/match 3 game. Rated 5 out of 5 by zia1954 from I really love this game I love card games and this game is one of the best I have played in a while. The story line is wonderful, the music is great, it doesn't wear on you, and the graphics are cute and crisp. This game also has a lot to offer , many many chapters and lots and lots of objects to collect. I have had some glitches but so far it has not shut down the game. It is challenging but but not so much that you abandon the game because it is too hard. There is so much to this game that you have got to try it!! !